The next step was to attach the battens to the leg assemblies with hinges, then screw and glue the battens to the bottom side of the top slab. 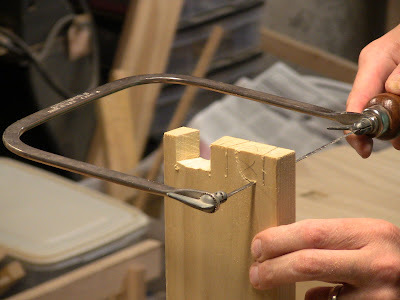 Using one of the battens as a straightedge to line up the hinges. 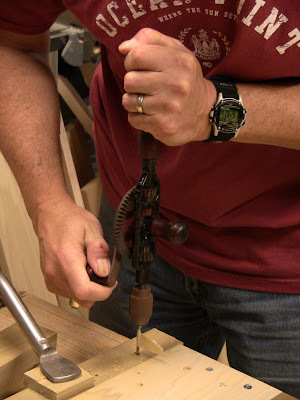 Using the smaller #77a eggbeater drill to make the screw pilot holes. It's nice to have a couple of drills available, one for the shank hole bit, and one for the smaller threaded section bit. I used a brace for the larger screw holes for attaching the battens to the top. After attaching the battens and screwing down the bottom board for the tool tray. You can see how the extra spacer on the left hand leg assembly makes things fold up flat. 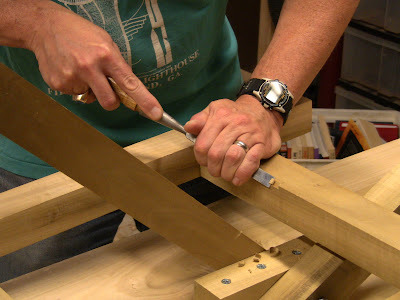 Chiseling the flats where the crossbraces meet the bottom rails. 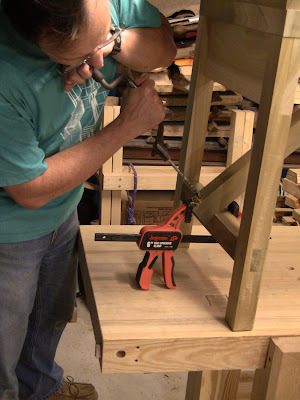 With the cross brace clamped to the rail, boring the hole for the removable carriage bolt. 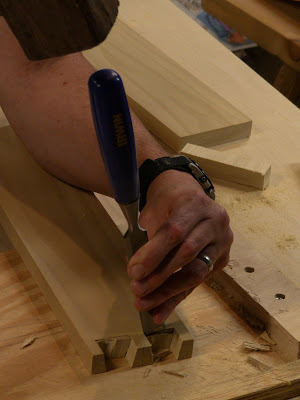 Chiseling the mortise for the planing stop. You can see the cross brace bolted in place, making the fold-down legs rigid. Cutting the pins for the dovetailed back skirt around the tool tray. 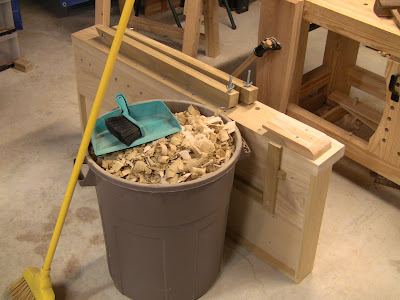 Removing the bulk of the waste with the coping saw. X marks it so you don't cut the wrong part! 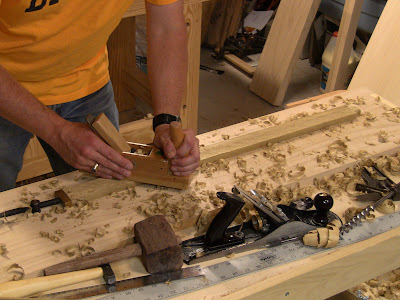 Chiseling the remainder down to the scribe line. 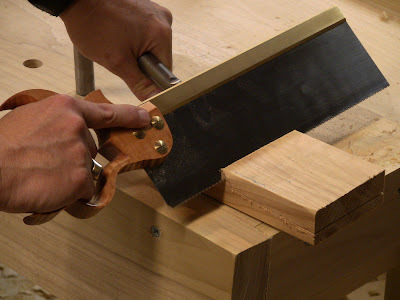 The chisel is tilted sideways to match the dovetail slope. A couple of quick chops to each side, then flip it over and repeat. The dovetailed skirt pieces glued up. What do you do when you don't have a long enough clamp? Ye olde Spanish windlass. Drilling the dog holes while waiting for the glue to dry. Attaching the skirt. 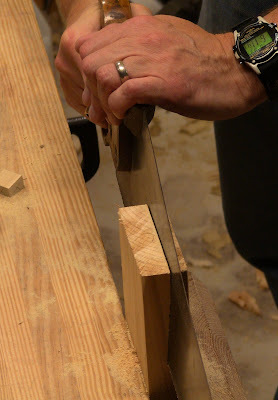 The square planing stop is lowered in its mortise. Cleaning up the end grain on the corners. After some rough hacking with a chisel, using a block plane to round over the end of the frog. 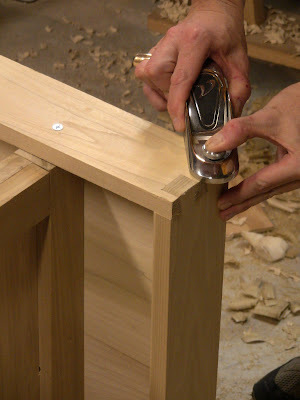 This screws to the front skirt to ask as a planing grip, the same as the crochet on a Roubo workbench. 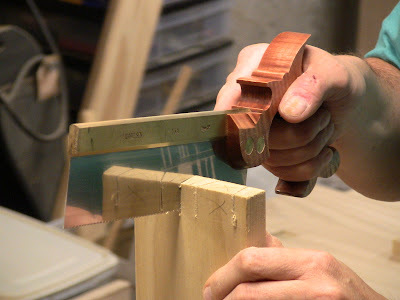 Ripping down the angled cheek of the frog, like making a large timber-frame tenon. The bench itself is complete. Scrubbing down a thin planing batten. 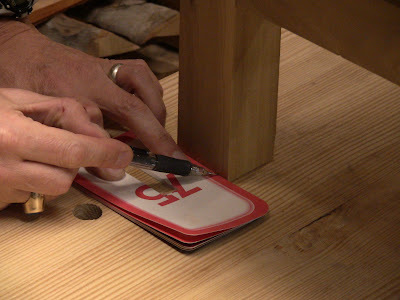 It will have 3/4" dowel pins that fit into specially-placed dog holes to hold it in place on top. 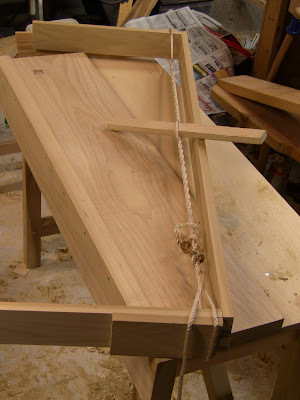 The final chairmaker's trick: after shimming up all the legs sitting on a flat surface, marking the amount that a leg needs to be trimmed to make all four sit flat on the floor. 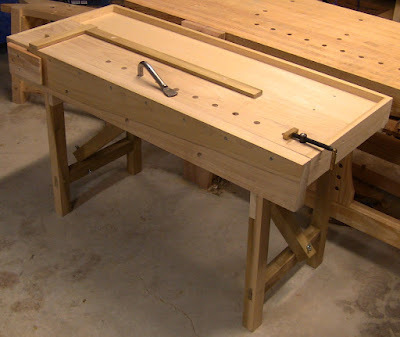 The completed bench with accoutrements after leg trimming. 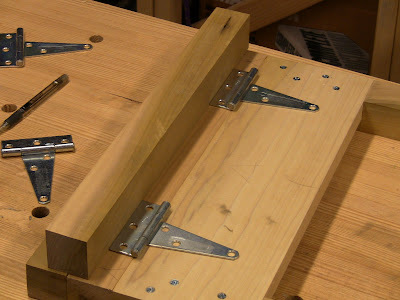 At left, the frog attached to the front skirt for capturing the end of a board when edge planing; the board bottom edge rests on pegs inserted in the dog holes in the front skirt. 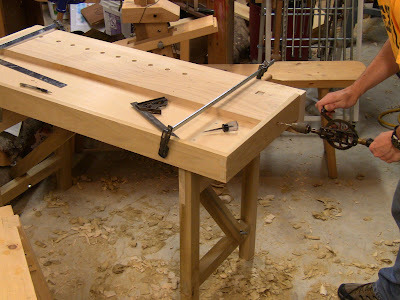 On top, the planing stop is raised to backup the short planing batten; both battens are inserted in their dog holes. 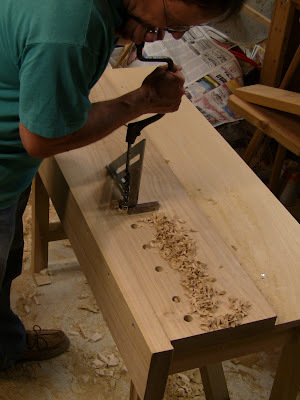 This allows you to plane into the corner without having to secure the workpiece. The Gramercy holdfast and Veritas Wonderdog are the work-holding devices. Bottom view, folded up with cross braces removed for travel. Top view. You know you've been having fun when the shavings barrel needs to be taken out to the compost pile! 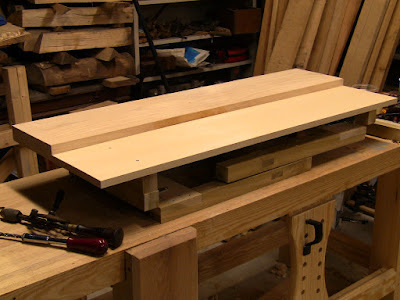 After being used to my giant Roubo workbench, I was a little worried this one might feel too light and flimsy. But it's good and steady, with enough mass to stay pretty well in place. It's small enough that I can brace one foot against a leg while working if it moves around any. Now to make another one! 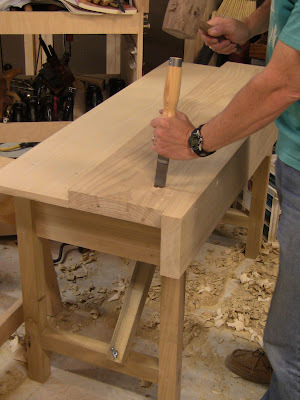 Continue to part 3 to see how to use this bench. Really nice build Steve. I enjoyed the series. You made it look easy and fun. Thanks! I've had some interest in how it all works, so I'll do a part 3 with some dramatic action photos. 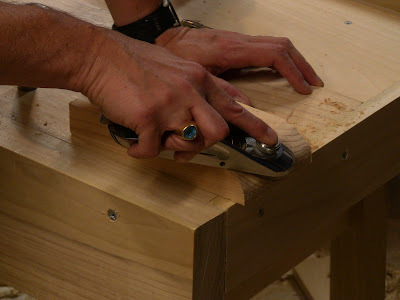 Some of the work setups may not be familiar to those who are used to bench vises. 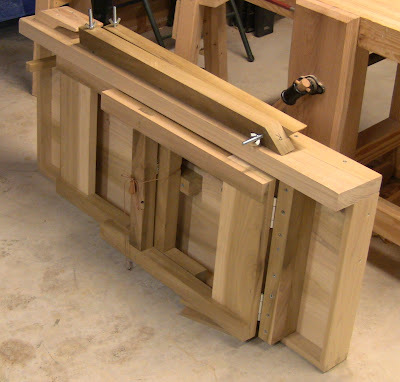 Were the battens on the underside of the bench attached with screws only or glue and screws? I would prefer glue and screws, but any issues with splitting the benchtop that way? I used glue and screws, after drilling pilot holes. The pilot holes should prevent any splitting issues. Steve, would a close up of that planing frog be possible? the shot in the book doesn't do it for me. I just about have my bench completed. I'm starting work on the frog and was hoping you could put some rough dimensions up. Length, width, thickness and how much clearance there is in the mouth. Thanks!